Important for the Air Quality inside your vehicle Most everyone knows that a vehicle has an air filter, oil filter, fuel filter and maybe even a transmission oil filter. But how much do you know about your vehicles cabin air filter? The first cabin air filters started being put in new vehicles in the 1980’s. Almost all new vehicles built today come with cabin filters. The most common location for the cabin air filter is to be located either under the dashboard, behind the glove box or in the engine compartment. 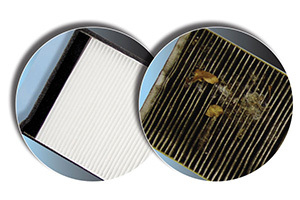 If you are concerned about your health and that of your passengers, changing cabin air filters is very important. Here is the reason. When you are driving, exhaust gases from vehicles in front of you, as well as pollen and other harmful substances, are pulled into your car as if you are driving inside of a tunnel. Because you are in an enclosed space that is rather compact, the concentrations of these substances can be six to ten times greater than they are outside. Should these filters be replaced? Yes, just like the filter in your home heating and air conditioning system your vehicles filter can become clogged with dust, pollen, and pollutants causing the filter to dramatically reduce the amount of air flowing through your vehicles heating and cooling system. Another problem is caused by moisture that promotes the growth of mold and bacteria that cause foul odors. It’s true! Your senses can locate vehicle problems! When you have your vehicle maintained on a regular basis at Mac’s radiator and Automotive Service we create a service history. During each visit, we also perform a 22-point courtesy inspection. Part of our job is to let you know what’s going on with your vehicle. During the inspection, we’ll take note of any components that need to be replaced immediately. We’ll also alert you to parts or systems that are beginning to wear out and nearing the time when they should be replaced. Use your eyes- Are there any signs of leaks or stains under your vehicle? Antifreeze (yellowish-green, pastel blue or fluorescent orange), oil (dark brown or black fluid), transmission fluid (red) and power steering fluid (also red) shouldn’t be leaking from your vehicle. If you notice more that a small drop now and then, it’s a good idea to bring your vehicle in for servicing right away and let Mac’s take a close look at the issue. Use your nose- Noticing an odd smell? A sweet maple like odor normally means antifreeze is leaking, if you are also getting a film on the inside of the windshield that indicates a leaking heater core. A burned toast smell could be an electrical issue. A rotten egg smell could indicate a problem with the catalytic converter or emissions system. Use your ears- Any squealing, knocking, scraping, clunking, pinging, rumbling sounds are not good, especially depending on from where they are coming. When you bring your vehicle in, let us know from where you think the sound is originating. Also let us know when it occurs. Are you stopping? Accelerating? Shifting to a higher or lower gear? The more information we have, the easier it will be for us to start troubleshooting the problem. At times we will have you take us for a drive and point out the noise when its happening. Use your touch- Difficulty with handling your vehicle or steering indicates a problem. If you notice a vibration or your vehicle is pulling to one side, does it shake when you brake? These are all problem that need to be addressed. Is your vehicle leaning excessively when you turn? Is it hard to stop your vehicle? Does the brake feel “mushy?” or do they become extra sensitive and grab? Again, take note of when you feel the problem and what it feels like. It will help make sure the problem is corrected. What does a vehicle’s water pump do ? What does a water pump really do? It drives the process for cooling the engine by helping a mixture of water and coolant or antifreeze to circulate around the engine of the car. This mixture absorbs some of the heat from the engine, and then it passes through the radiator and heater core where there, the heat is removed before the process begins all over again. Without a properly functioning water pump, your vehicle will not get you very far. If you see leaks or hear grinding and whining sounds coming from the area where your water pump is located, have them inspected by a qualified technician who can give you a proper diagnosis. Your local Mac’s Auto Center can help you with this. In some cases, the water pump is easy to see under the hood. Most of the time, if you can easily view the pump externally, the serpentine belt drives it. Water pumps that are driven by the timing belt are found under the timing belt cover and cannot easily be seen. If you have to remove the cover to replace the water pump, then you should consider replacing the timing belt at the same time because the coolant mixture leaking from the water pump may have contaminated the belt. Remember, timing belts usually need replacing in the 60-90K mile range anyway, so having both jobs performed at the same time could make sense because the technician already has the cover removed. Your Mac’s Auto Service will be able to recommend options for you after the diagnosis has been completed.